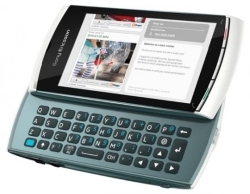 Sony Ericsson has announced its latest gadget, this time targeting the world stage. Sony Ericsson’s Vivaz Pro promises to be a high class mobile handset. It looks excellent from the outset – a prim and proper framework, a cool black and chrome design make it trendy. Weighing a mere 97 grams, the device measures 107 x 51.7 x 12.5 mm in length. The phone comes in a variety of colors – silver (branded as silver moon), black (branded as cosmic black), blue (branded as Galaxy Blue) and red (branded as Venus Ruby). The phone is fitted with a 3.2 inch resistive touch screen display capable of providing great color resolutions at a maximum resolution of 340 x 640 pixels. It can display a variety of colors – a mind boggling 16 million colors can be displayed on screen in this device. An accelerator sensor has been fitted into the device to sense rotation of the display from landscape to portrait and vice versa. With an 8 mega pixel auto zoom enabled camera, the phone has the capacity to render outstanding images with high quality photo finishes. Image resolutions of up to 3264×2448 pixels can be captured in this device – the camera is the coolest feature of this mobile phone. Vivid, colorful images and a video recording feature – 720 pixels at 24 fps (with continuous autofocus enabled) is also present in the device.The camera has a built-in autofocus feature with geo-tagging. It is built with LED flash and can recognize a smile or a face. The device runs on a 720 MHz, PowerVR SGX CPU, and has an internal storage capacity of 75 MB, expandable up to 16 GB using microSD cards, slots for which are provided on the phone. The device runs on a 512 MB RAM and has good application running capabilities. It is priced between 600 to 700 dollars.